I recently made this spicy chipotle white bean dip from Damn Delicious for the NFC Championship game a few months back – when the Seattle Seahawks won!! Yeah!! Ok, that’s over now. 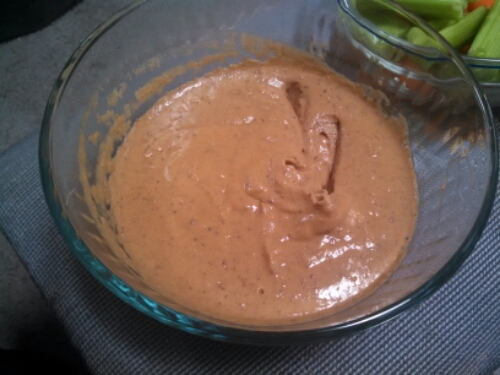 But I gotta admit: I omitted or substituted almost everything in this recipe, so it basically turned into a “Super Spicy Sriracha White Bean Dip” instead of the former. I omitted the 3 things that give the dish its name and spiciness (chili peppers in adobo sauce, cumin, and chili powder). However, I added in some red pepper flakes and lots of sriracha. So basically I made something entirely different. But whatever. I’ll post the recipe as the original blogger created it – let me know if you make it and what you think of it! -In the bowl of a food processor, combine cannellini beans, chipotle peppers, garlic, lemon juice, cumin and chili powder. -Add olive oil and process until blended. -Serve with pita bread, tortilla chips, veggies, etc.